Jeff Quinney of Eugene, Ore. is the reigning U.S. Amateur Champion. Quinney won the 2000 Amateur at Baltusrol Golf Club, site of the 2001 Palmer Cup. Quinney defeated James Driscoll in a match that went 39 holes and lasted more than 24 hours. Lightning and darkness forced play to be extended to Monday, August 28. Quinney defeated his Palmer Cup teammate, Lucas Glover of Greenville, S.C. in the second round of the 2000 U.S. Amateur at Baltusrol GC. Nine of the 16 players in the 2001 Palmer Cup presented by CSFBdirect have competed in the Palmer Cup at least once. Palmer Cup veterans are Nick Cassini, USA (2000), Jamie Elson, GB&I (2000), John Engler, USA (1999, 2000), Lucas Glover, USA (2000), Graeme McDowell, GB&I (2000), Bryce Molder, USA (1998, 1999), Philip Rowe, GB&I (1999, 2000), Kyron Sullivan, GB&I (1998, 1999, 2000) and Chris Wisler, USA (2000). Sullivan has competed in the Palmer Cup more than any other in its five-year history. He has represented Great Britain and Ireland in the event four times. 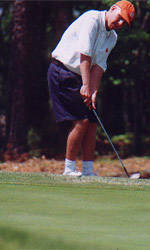 Rowe sank a 20-foot putt for birdie to halve the final match of the 2000 Palmer Cup. The putt secured GB&I’s first victory in the competition’s history. The United States leads the series with two wins, one loss and one tie. The pin placements for the four rounds of the 2001 Palmer Cup presented by CSFBdirect will be in the same as the 1993 U.S. Open. Erik Compton of Miami, Fla. finished second at the 2001 Northeast Amateur in Rhode Island. Compton was defeated by Luke Donald in a six-hole playoff. After the playoff, Compton and six other Palmer Cup golfers drove more than four hours to arrive at the host hotel in Summit, N.J. at 11:30 p.m. Sunday. USA Coach Bob Ellis recently completed his final season as a college golf coach. Ellis was at the helm of the Texas A&M program for 27 seasons. The Golf Channel is taping the Palmer Cup for tape-delayed television coverage. The two-hour highlight show will premier September 6. The Golf Channel is placing microphones on the players throughout the competition to include in the broadcast. Molder and Quinney were two of three amateurs that competed in the 2001 U.S. Open at Southern Hills in Tulsa, Okla. Quinney posted rounds of 82 and 73, and failed to make the cut. Molder was the high amateur, finishing tied for 30th with a score of 288 (+8). The 2001 Palmer Cup is presented by CSFBdirect, the online brokerage of Credit Suisse First Boston. Twelve of the 2001 Palmer Cup golfers earned PING All-America honors for their play in the 2000-2001 college season. GB&I PING All-Americans include Jamie Elson, David Inglis, Graeme McDowell and Oliver Wilson. Every player on the USA team earned PING All-America honors. Three universities have two players in the Palmer Cup.Jamie Elson and Oliver Wilson of Augusta State, Lucas Glover of Clemson and Nick Cassini and Erik Compton of Georgia. Baltusrol Golf Club, Springfield, N.J.